Cricket fans eagerly waiting for the IPL- Indian Premier League. The dates of the 12th season of the Indian Premier League ie., IPL 2019 have been announced by BCCI . Now IPL 2019 is ready for entertaining its audience. The first match will be played today ie March 23. In IPL 2019, a total of 8 teams will participate. Only a few days after the IPL, the World Cup is also 2019. There is a different enthusiasm in the people about the IPL. This is the reason people want to know before the beginning of IPL 2019 that they will be able to watch the IPL 2019 broadcasts on the country and abroad, and where the live streaming of these matches will be. 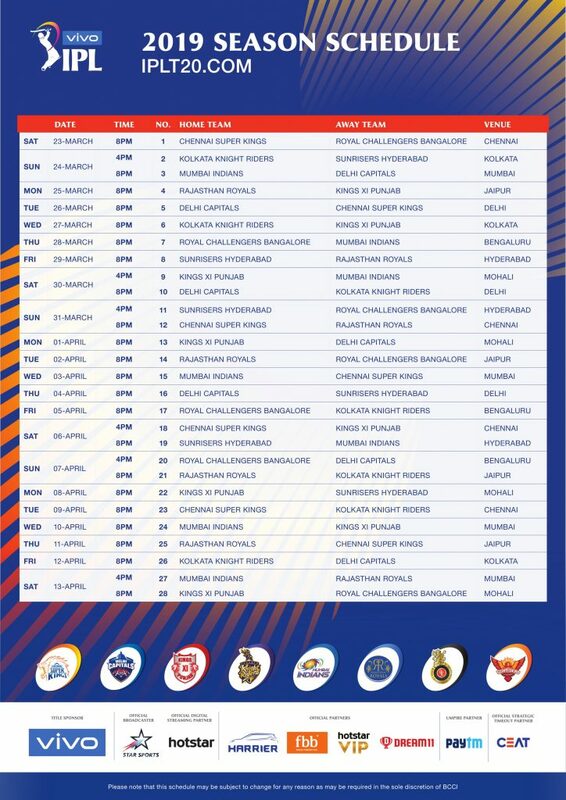 So, before the IPL 2019 Season 12 starts, let us have all this information so that you can take full advantage of the Indian Premier League 2019. The matches will start from March 23 and the schedule for the first part has been released. There will be a total of 17 matches in the first division. Due to the Lok Sabha elections, schedule of the second part will be released later. Talking about the IPL 2019 teams, 8 teams are participating in this. Below is the IPL 2019 match time tables. Two months from now, it is going to be very special for cricket lovers. Because the IPL season 12 starts with a bang. Today the first match will be between Chennai Super Kings and Royal Challengers Bangalore, but the special thing about the IPL 2019 is that there will be no opening ceremonies this time. In fact, it has been decided to not open the inaugural function of the IPL 2019 to express condolences to the CRPF jawans who were killed in the Pulwama attack on February 14. Although a military band will definitely perform at the stadium before the first match. Let us know that this is the 12th season of the IPL, in which total 8 teams will play in this tournament. 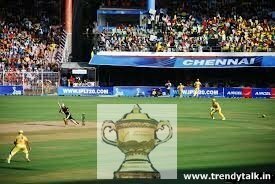 Today the first match will be played between Chennai Super Kings and Royal Challengers Bangalore. There is a lot of enthusiasm about the IPL 2019 in the audience. It is being said that the entire amount of Opening Ceremonies will be given to the families of the martyrs of the CRPF jawans. Apart from this, all the players from Chennai Super Kings have also decided to give their first match fees to the families of the martyrs. Last year, Broadcasting Rights of IPL or Broadcasting rights were purchased by Star Sports Network for 16,347.50 crores. This agreement is valid for five years. It will last from 2018 to 2022. This means that on the Star Sports Network you will be able to enjoy IPL 2019 too. Apart from India, the broadcast rights of the IPL in the countries of the Indian subcontinent like Sri Lanka, Bangladesh, Nepal, Bhutan and Maldives are with the Star Sports Network. The IPL 2019 can be seen on Live Streaming Hotstar app (hotstar) or www.hotstar.com. These broadcasts will be done in 7 languages ​​Hindi, English, Kannada, Telugu,Tamil, Malayalam and Bengali. How to see IPL 2019 in United States ? The IPL , COO (Chief Operating Officer) and his team have prepared the program after hard work. Thanks to the hard work of their team, the first time in the election year, the IPL is being organized inside the country without going to foreign land. IPL matches were played in South Africa in the year 2009 and the inaugural IPL matches in UAE in 2014. In such a situation, this year's annual fair of fast food is a big achievement for the Board. This year the competition is ought to become fierce as all teams are really good. KKR is as balanced as it could ever be and planning to take their 3rd title. RCB is another team looking to break their drought. Delhi Capitals got plenty young Indian batting squad. Kings XI Punjab have fantastic spinner & strong batting lineup. Rajasthan Royals has backing of their strong pacers. Mumbai is also a good team which has been consistent team. Chennai Super Kings have retained their last majority of the squad. Now the team to talk, the Sunrisers Hyderabad are mighty as a mammoth once again. This year its going to be anybody‘s IPL, so let just sit and enjoy, hoping the best team wins.